Who are my in-kind supportersand key partners? Other: The activity is better done in a group. 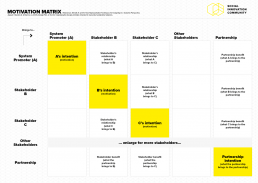 The Motivation Matrix helps teams understand the connections between the various actors that take part in the solution and adds clarity also to their roles by investigating the motivation behind their action. The tool helps to answer questions regarding the interests of each stakeholder and what their expectation is from their involvement. It is a good strategy tool for partnership managers and network development. The Motivation Matrix can be done individually or in groups (preferable). The first step is to make a list of your stakeholders (See Stakeholders Map tool) and organize them on the matrix accordingly. The next step is to analyze one by one relationships and benefits of each stakeholder.